Slow-smoked tender pork, sweet vinegar-based BBQ sauce, served over creamy grits, and tangy greens, topped off with killer crispy onion rings. The portion size was ginormous. Because I travel and have to eat, I am always thinking of how to build an empire of restaurants that might serve real food, with great taste, real fast, and at a reasonable price point. In this dream, there are neither microwaves nor deep fryers. Everything would be made from scratch and the cooler would look like my fridge at home; brimming with fresh local produce. Coleslaw #36 or 66 on Meg’s 100 Dishes Countdown. Before visiting Full Moon Bar-B-Que, I was already thinking of how to rate this coleslaw. I like coleslaw but I wondered-would coleslaw rock my world, like ever? Would I send someone from another part of the country and say you must try this coleslaw before you die? That said, I liked Full Moon Bar-B-Que’s marinated coleslaw. Since the recipe was on-line, I was able to dissect the ingredients. This recipe sets itself apart from the average coleslaw.. There are fresh ingredients such as; real celery vs. celery seed, onions, green peppers and a hint of pimento, this recipe is very tasty. I love that this side dish is healthier than a mayonnaise based recipe. I understand that many who try this recipe have requested to duplicate it. It is not the mayonnaise-based coleslaw recipe that is found in most fast food type restaurant chains. Here is the breakdown on my rating. MEGastars *** as coleslaw goes, this was a pretty tasty side dish with some ingredients that were not the ho-hum. This dish is certainly deserving of a 4th By using this recipe, Full Moon folks takes extra steps to set itself apart from Mc-coleslaw. 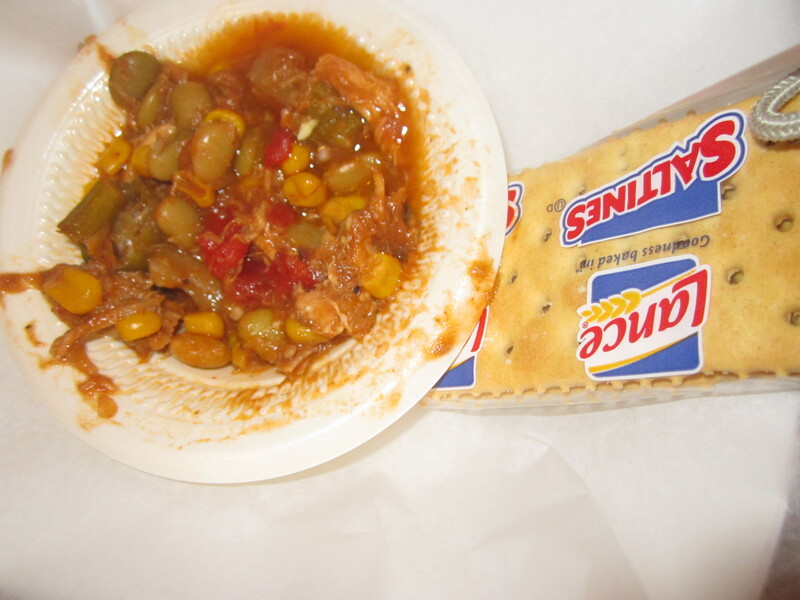 This dish meets the criteria set forth by Alabama Tourism with local foods, a local recipe served with Alabama Pride. As a side note, I really like visiting Full Moon Bar-B-Que and this overall impression added to my positive experience. I visited this establishment with my sister before I moved to Alabama (and began playing “The 100”) My sister is a fan of Full Moon. I can understand her love. Myself? I love their logo. I love that they have food trucks. I love their cleverness. I love their menu that includes healthy choices. I love the interiors of the restaurant decorated with sports theme and flat screens on the walls. And it’s not just me, this restaurant was voted in the Top Ten BBQ Restaurants In The U.S. by Huffington Post 2013 So I would send someone to full Moon Bar-B-Que for a full meal experience. And this didn’t hurt my respect either. The life of a Packer fan in Alabama. The coleslaw was one of two dishes to make “The 100 Dishes” list. 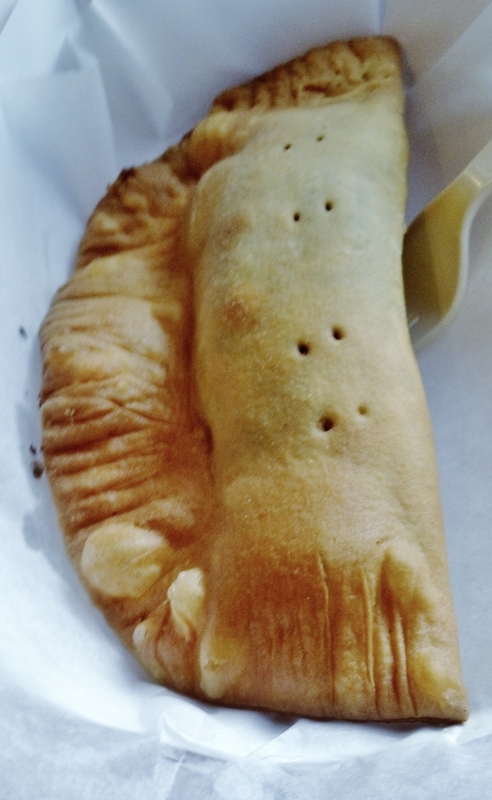 Try the other dish; the Half Moon cookies which are made fresh daily. See prior blog. Check out their chow-chow. This is an amped up condiment that is a relish with some zip. This recipe is To give you an idea, Chow chow is usually made with ingredients of; cabbage, mustard, turmeric, onions, green tomatoes, red and green peppers, salt, sugar, celery seed, vinegar,water and sometimes jalapenos. It is served on their BBQ sandwiches and plates. It is unique, organic and gluten free and is loved so much, it is being sold in their restaurants and Birmingham area supermarkets. More exciting than sauerkraut. Love it or hate it? Take home their famous dishes. On their website it is called Full Moon Swag. These items would make great gifts. There are also shirts that say “Best Butts In Town.” this place is cool. While growing up in the heavily populated German and Dutch area of Wisconsin, my sister and I had a ranking system for a unique to that region event called “Friday fish-fry.” (I’m not even going to get into this subject, there are entire blogs written on this subject. No joke.) Both of us worked at restaurants that held the beloved Friday fish-fry. 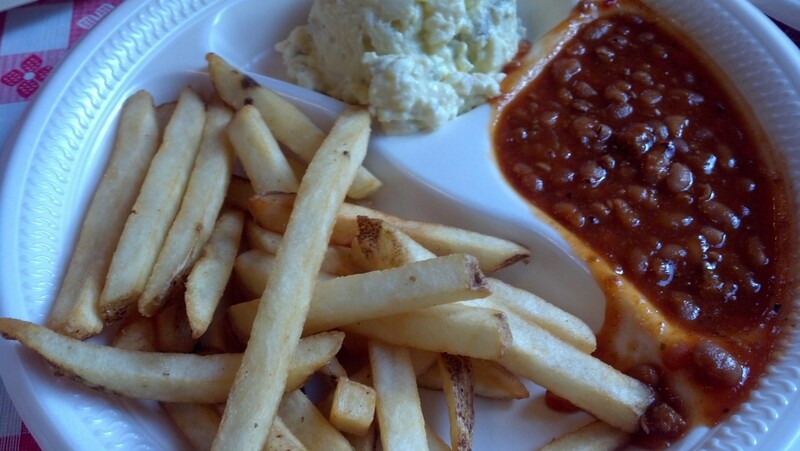 Coleslaw, which originates from Holland and Germany, is a staple on our Friday fish-fry plates. The coleslaw had to rank highly to get our fish fry stars. It could not be too tart or too mushy. I feel a bit less like “just Meg” and more like an expert on coleslaw. 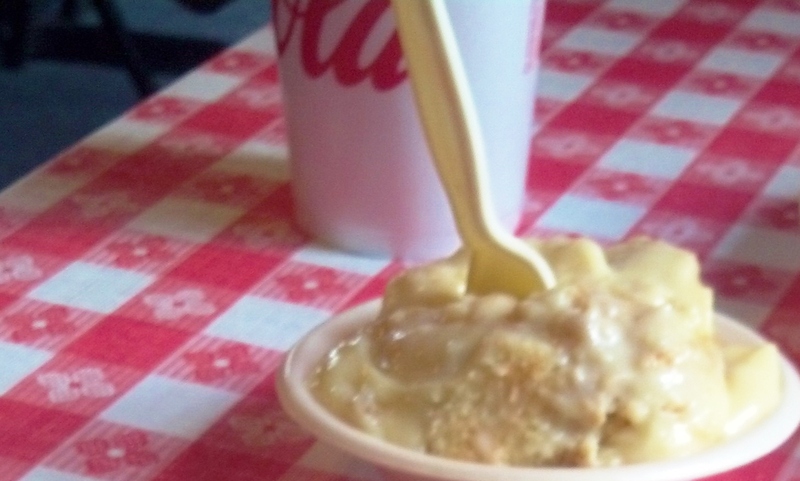 In my prior blog, I wrote about my first “dud” while playing “100 Dishes In Alabama To Eat Before You Die,” and that sucked. Because of that unfortunate attempt, I got hungry, rambled around Prattville Alabama and hit a home run at Fat Boy’s Bar-B-Que Ranch. Even though Prattville was not a “megastop,” I went all higgledy –piggledy here. I found some weird things to do and ate some good chow. I am digging kickin around Alabama. 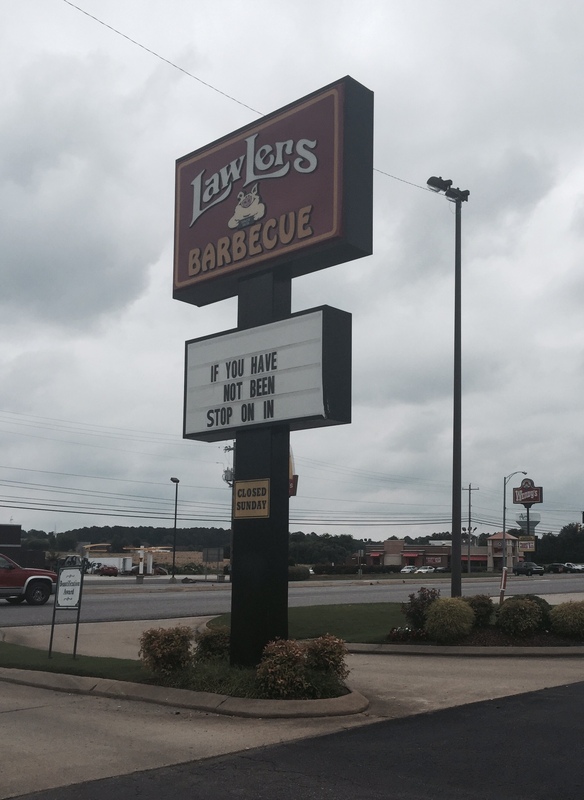 Millions of people pass by Prattville, Alabama on I-65 and never take the quantum leap to BBQ nirvana, and yet just a few short minutes off of I-65, in historic downtown Prattville and on the banks of the Autauga Creek, my barbeque world was rocked. Fat Boy’s is a family owned and operated BBQ place “where everything is homemade, the way it is supposed to be.” I just absolutely LOVED the food. 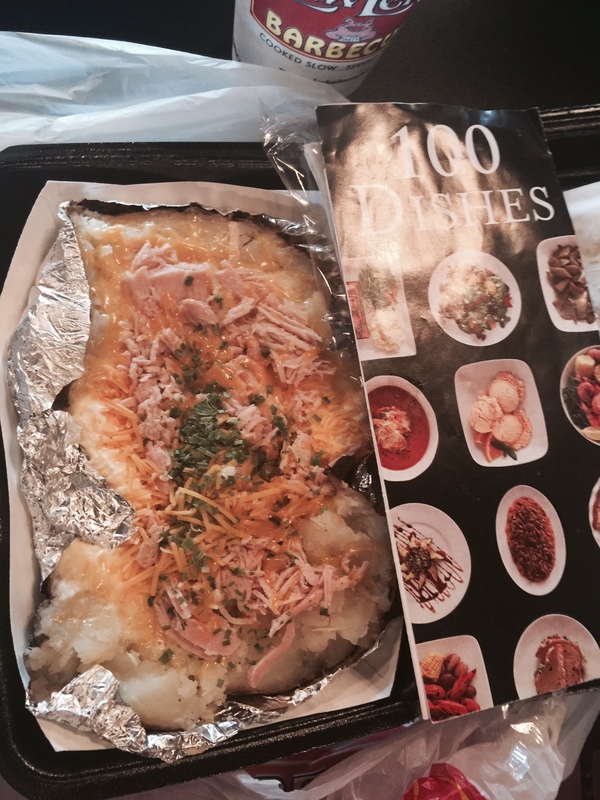 It is NOT on the list for “100 Dishes To Eat In Alabama Before You Die.” In my humble Meg opinion, it should be. I have eaten in BBQ places all over the U.S., and this one is Bomb Diggety, likely my new personal BBQ favorite. Beautiful sign against Alabama sky! 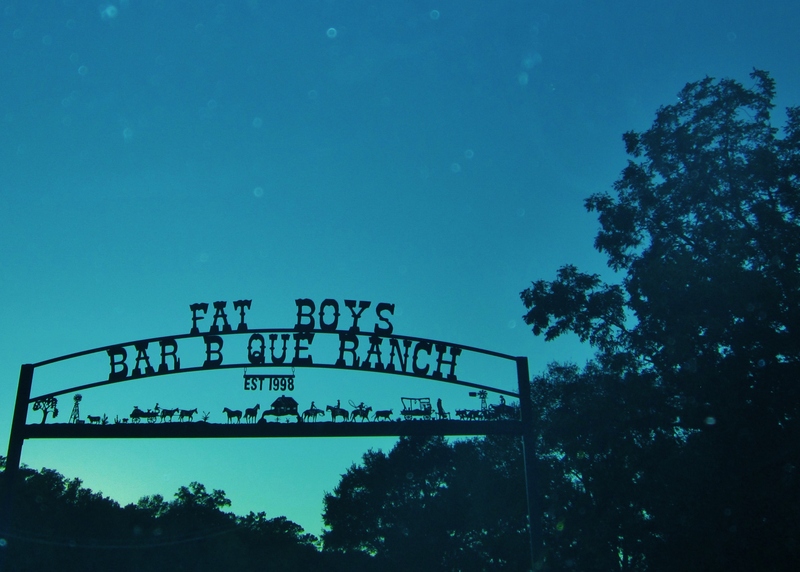 As if driving onto a ranch, you enter the parking lot through a customized crafted iron overhead sign and smell the cooking. 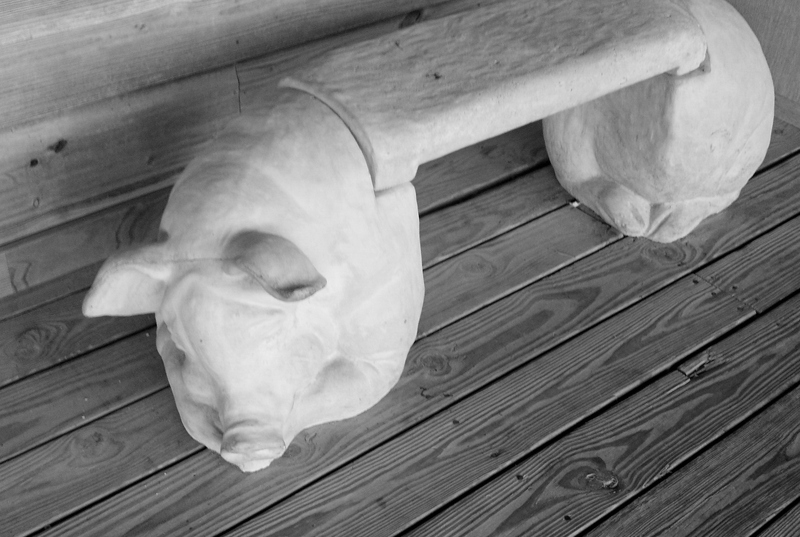 A concrete pig bench greets you and framed articles that have been written about this establishment hang on the walls, some from well known magazines. This is a very clean restaurant and your eye wanders to all of the interesting things. The point being that the owners took the time to show pride in their details. You order at the counter, get your own drink, and seat yourself in either the indoor or covered outdoor area which overlooks the creek. The food comes out really fast. It is served on Styrofoam and you clean up after yourself. I know this fact would be a downside for some, and usually these places are ruled out by my husband, but he also loved the food. I thought it was like a picnic thing and I had no issue with it. 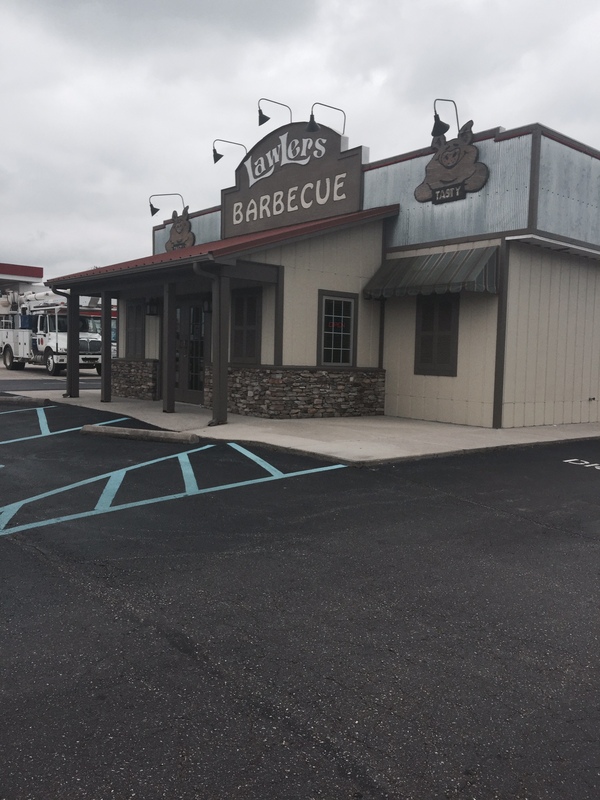 Their meat is smoked over natural hickory hardwood right on site. I tried all of their meats on what is called a “Fat Boy Favorite” and gives you a taste of their selections. I was blown away by the chicken and my husband loved the beef brisket and the ribs. 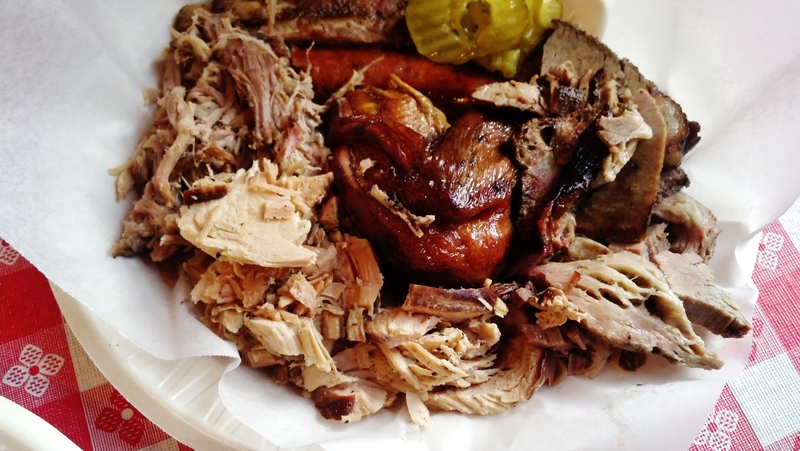 Usually, I only order pulled pork at BBQ places but the smoked chicken is the BEST that I have ever eaten. The skin of the chicken is crispy and looks like a work of culinary art. Apparently, I am simpleton. All of their meats have this amazing smoky flavor. I am talking taste that rolls around your tongue and you blow smoke rings, in my mind anyway. The meat is moist, not soggy, nor dry, simply sheer perfection. 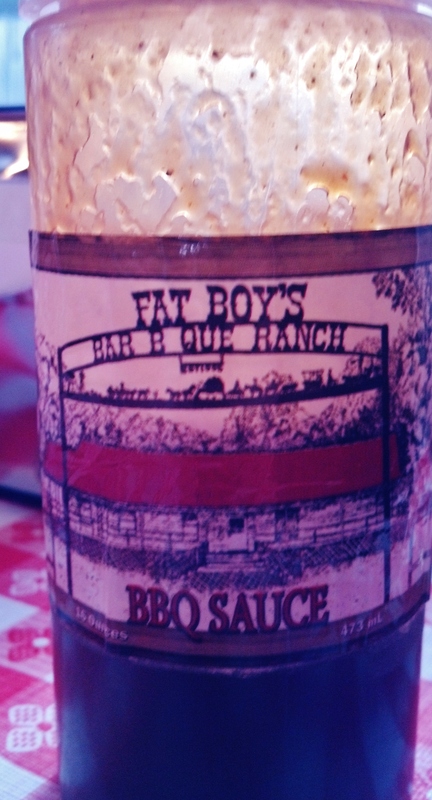 They make their own tomato based sweet BBQ sauce but I just love the taste of their smoked cooking, naked, sans sauce. I would never have ordered the sausage but it was on the platter, holy smoked animal, it was really great stuff. The homemade sides which are served were perfect. My husband loved the unique baked beans. 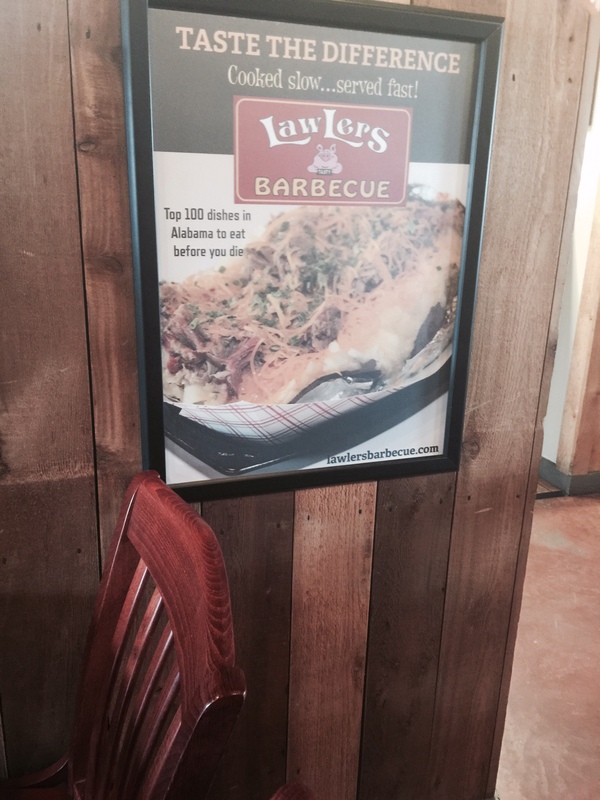 The BBQ tater menu is great and I noticed people ordering them. They have a camp stew which doesn’t look great in a photo but tastes really good. Portion size is ample and I am thankful when I go out to eat that I get enough to eat. This leaves me to the desserts. I normally do not order dessert after a big meal. Since I have a mental scorecard for BBQ joints, and this mental list includes dessert, I decide if the place is over the top good based partially on their dessert. And check this menu out; homemade banana pudding, strawberry pudding, peach cobbler, fried apple pie, fried blackberry pie, pound cake and Blue Bell Ice cream. Are you kidding me? I tried the Banana Pudding and my husband had the fried blackberry pie and ice cream. Seriously, it was to die for. Slap your grandma. The BEST! Megatips– check their website or call before you go as they have their own operating hours and are closed on Sunday’s. Bring a friend and try the “Fat Boy Favorite.” Leave room for dessert.